It’s extremely rare for an album to knock me for a loop, stop me dead in my tracks, and demand the full breadth of my attention. It’s been so long since music truly moved me, I’d lost touch with the ability to relax and take in the beauty of a master at work. The amount of skill that went into crafting Hello Cruel World was apparent from the first listen. Lyrically heavy, the results are nothing short of stunning. 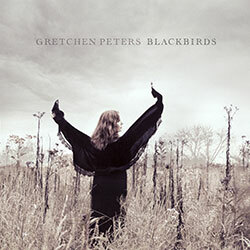 I came of age during the 90s, so I grew up with the masterful songwriting of Gretchen Peters coming from my stereo speakers. The body of work she set free onto her fellow female artists is just astounding from “Independence Day,” to “You Don’t Even Know Who I Am,” “Let That Pony Run,” to “The Secret of Life.” I was a fan of her work long before I’d ever heard one of her albums. The album opens with crashing drums and fiddle creating a moody yet steady beat that perfectly compliments the opening line – haven’t done as well as I thought I would/I’m not dead but I’m damaged goods/And it’s gettin’ late. A mission statement of sorts, it serves as Peters declaration towards freeing herself from the demons (Nashville floods and Gulf coast oil spill) that inspired the record. On the title track, Peters brilliantly plays with the mind pairing moments of abject despair with flickers of hope. She may be the bad end of a shaky deal, a ticking clock, or a losing bet, but she’s still a lucky girl. It’s difficult to work the delicate dance moving between negative and positive, but she executes it with an ease rarely seen. For most of the project she lays bear the pain and suffering she took from her inspirations. This is an album from a woman who’s been through hell and thrived. Peters is writing from a place of security, not of anxiety, and it makes for a fully realized portrait of someone now able to receive the the goodness life has to offer. But what a journey she had to undertake in order to find healing on the other side. The anxiety she’s overcome is still readily at her fingertips, and for listeners, that’s a joy to behold. On the surface, “The Matador” is the story of a woman watching a duel between a matador and bull and the flourishes of accordion accentuate the spanish flare. But underneath the metaphor is the gut-wernching tale of a woman barely holding on in the face of confrontation – I loved like only a woman can, a very complicated man/I bound his wounds/I heard his cries/I gave him truth/I told him lies. She comes to hate herself for what’s she done as this affair tears her already shattered family apart. The devastation climaxes when she lets out her battle cry – And he is bull and matador/And I’m the mother and the whore/And this is how the story goes/I knew it when I threw the rose. In fully analyzing “The Matador,” the missing puzzle pieces that made composing this review so difficult, are beginning to fall into place. The uptempo “Woman On The Wheel” with its memorable line – As if god was Monty Hall and this was Let’s Make A Deal, puts words behind those feelings of ridicule when someone feels like they’re target practice for everyone’s insults and jabs. It seems odd to comment on production when it’s a secondary element, but I love the acoustic guitar opening and light drums producers Doug Lancio, Barry Walsh, and Peters herself paired with these lyrics. “Natural Disaster” gives the greatest insight into Peters psyche. The idea “The world ain’t gonna stop for my broken heart,” rings true once again. The weatherman is predicting sun yet she’s hoping for a hurricane to mirror her circumstances. That hurricane never comes, and she sees all the more clearly her ability to survive life’s toughest challenges. “Natural Disaster” is also one of the most vivid lyrics on the whole album with stunning couplets around every bend – we tore through each other like an avalanche…like a landslide baby on a suicide run/no thought to the damage done. Equally heartbreaking is “Five Minutes,” a relationship song about a mother and daughter. She sings of smoking herself to death and of the man she loved all those years ago (Back when you were Romeo and I was Juliet West Texas Capulet and Montague), the one that bore the child she’s now raising. In a role reversal, the daughter is looking after her mother who easily throws back upwards of three glasses of wine a night. The relationship between the two is so richly painted you feel for the daughter and her chance to run away and essentially repeat her mother’s mistakes. The production works in the song’s favor here, as the soft piano and equally haunting vocal only add to the desperation in the lyrics. Completing the beat-up-yourself relationship saga is “Camille” a song about a woman sick with guilt for the life she’s living, but so inthralled with addiction she cannot stop. 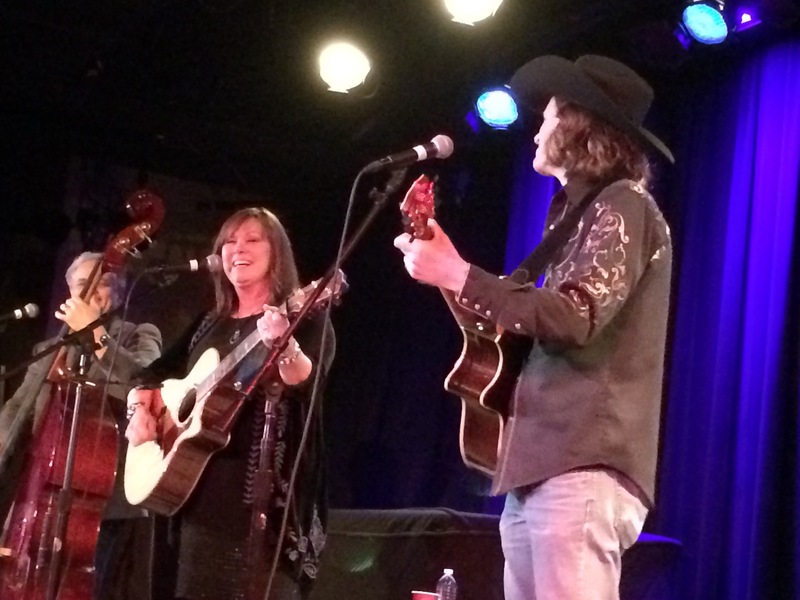 Co-written with Matraca Berg and Suzy Bogguss, it details the inner turmoil of looking deep within and asking tough questions – And you don’t want to cry/and you don’t want to think/And you tell yourself it ain’t no big deal/And you feel like a fool, and you feel like a drink/And you drink so you don’t have to feel/But you still do, don’t you Camille. 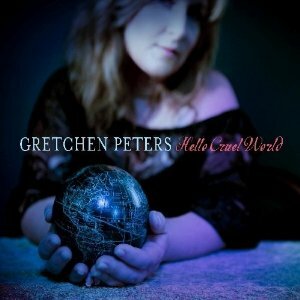 For all the inner and outer affliction Peters grapples with on Hello Cruel World, that sense of inner peace this journey has brought her to comes to light on “Paradise Found” which details the feelings around her 2010 marriage to Barry Walsh. Here is where all the anxiety turns to security in the most palpable way – a loving home. Sonically, with the strong fiddle and drums, it’s the most modern sounding track on the whole project. I love how the beat and dark overtones suggest a journey that isn’t complete, even though there’s comfort in the security of a healthy home life. For me, Hello Cruel World has made 2012 a very exciting year for music. It’s too bad it came to light in January, only because it set the bar so unbelievably high. I’ve always been a fan of lyrics and this album more than feeds that need within me. This is thinking people’s music from a true master of their craft. But what strikes me most is the production. Instead of being a straightforward singer/songwriter record (like, say Darrell Scott’s Long Way Home) it has many overtones suggesting it has more mainstream sensibilities. The songs aren’t as quiet or sparsely produced as I expected. I was anticipating more of a folky vibe but instead found something much less heavy and far more enjoyable. Country radio won’t touch it with a ten foot poll, but that hardly matters to me, as music this outstanding isn’t meant to be tied down or given genre specifications. It’s just music. And I couldn’t ask for anything more.